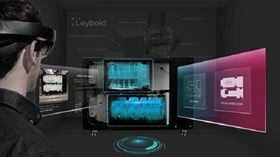 Leybold uses augmented reality to give customers an insight into its products. Vacuum pump manufacturer, Leybold, will present its products at the Optatec trade fair in Frankfurt from 15 – 17 May. Optatec is an international showcase for advanced technologies which target development and production. It also focuses on industrial use of optical components, opto-mechanics, opto-electronics, fibre-optics, laser components and manufacturing systems. Many of these applications require a reliable, clean fore vacuum and a fast, stable high vacuum. Leybold’s products can be used in these kinds of technological applications. In optical coating processes, vibration monitoring systems for the installed pumps offer potential in terms of maintenance. Increased wear on the pump can be detected and influence process conditions, such as deposit formation or particle entry. Maintenance measures need only be initiated when the state of the pump requires intervention. The company says that, in most cases, companies may not need to install an additional sensor, as it uses the data that its pumps are already producing. However, additional sensors can be used to increase the predictability in more complex tasks.